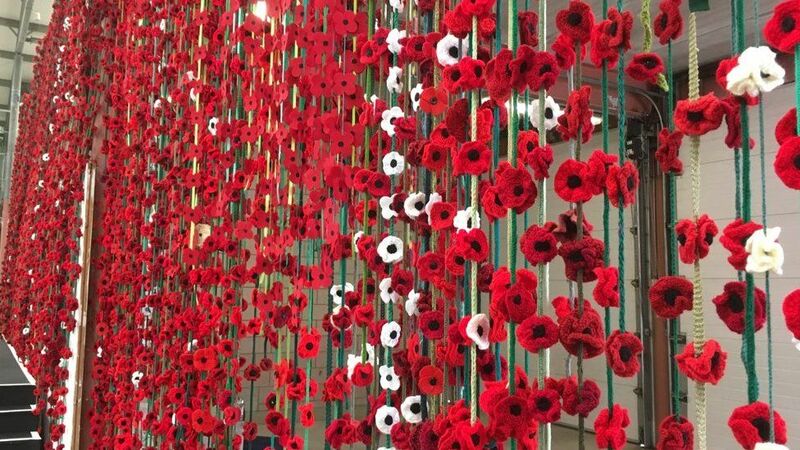 From Mid October till 11th of November knitted and crotched poppies made by you, the community, will be displayed throughout Chelmsford Centre on this special centenary year, 100 years since the end of WW1. Be part of it and create poppies! Below are two patterns, one for knit and one for crochet. Deliver your poppies to the Ideas Hub Chelmsford by the 11th October. Collect free wool, sponsored by John Lewis, from the Ideas Hub, Chelmsford Central Library. Attend the Essex Knitter and Stitchers Group workshop on 26th of September 10:00 am until 12 noon to get involved – it’s Free! To create some spectacular poppies installations in Chelmsford. The Ideas Festival 2018 theme is Peace – we’ll be looking at the question: WW1 – 100 years on where are we now? It’s the centenary of the end of the great war and we want Chelmsford to remember – with a spectacular and meaningful yarn bomb of poppies. – no prior knowledge needed just come along and we’ll show you how it’s done. If you want to get involved but can’t make this date – don’t worry. Deliver your poppies to Chelmsford Library – where they are stored in the Ideas Hub’s Area! – You can download a pattern from online and/or pick up some wool and the pattern from Chelmsford Library. – We are looking for poppies in Red and in White, (white symbolizes Peace, Red is for remembrance). All poppies are needed for Mid October. Thank you to John Lewis for sponsoring us with Wool. Thank you to the Essex Kitter and Stickers Group for running this workshop. Spread the word and share this event with anyone you know who Knits or Crochets! You can collect wool from Ideas Hub – Chelmsford Central Library. Round 1: Using a 4/4.5 mm hook and black DK wool, chain 4. Join with sls to form a circle. Chain 3. Work 11 double crochets into the centre of the circle and join with slst into the top of the first chain. Tie off and sew in tail. Round 2: Using red wool join with slst into any gap and chain 3 then 2 dc into same gap and chain 3 then 2 dc into the same gap. Repeat, working 3 dc into each gap until the end. Slst into the first chain. Round 3: 3 chain, then 1dc into the same gap. Work 2 dc into each gap until the end. Slst, tie off and saw tail in. Materials: Red or White and Black DK yarn, needles UK size 9 (3.75 mm). You can collect wool from Ideas Hub – Chelmsford Central Library. 1. Using red or white yarn, cast on 60 stitches. 2.1 row (right side) knit. 2nd row knit. 3. Knit 3 together. Repeat to end of row (10 stitches). 5. Knit 2 together. Repeat to end of row (10 stitches). 6. Repeat step 4 and 5 above (5 stitches). 8. Using black yarn, cast on 12 stitches. 1st row (right side) knit. 2nd row knit 2 together to end of row (6 stitches). Cut the yarn and thread the tail through a darning needle and through remaining stitches and pull tight. Sew into the center of poppy. Tie off ends invisibly. Leave Tail of 4/6″ (10/15 cm) this is who we are going to join them to other objects.